Paul McCartney Tells Us About His Most Famous Songs . Beatles Radio: The Beatles, Solos, Covers, Birthdays, News The Fab 4 and More! 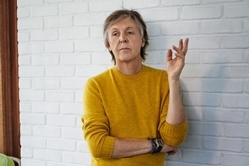 Music icon and GQ cover star Paul McCartney has been writing songs for more than sixty years now, and even the world's biggest Beatles fan probably doesn't know everything about every single one of them. He sat down with GQ to discuss some of his best, most famous, and most significant works, from the bizarre, swirling interlude in "A Day in the Life," to the surprisingly controversial history behind the title of "Hey Jude." Here are a few of our favorite anecdotes.